An old Forest Service four bunker in the head of the Trent River. The hut is getting minimal maintenance from DOC & needs some kind soul to give it a good dung out and get rid of the mice. It also appears to have some leaks though it wasn't raining when we visited. There is no heating the open fire having been removed at some stage! This hut is sometimes called Lagoon hut because there is a large tarn & some smaller ones close by. The tarns were shallow and full of tadpoles when we were there and the water supply creek had dried up. This hut puts you in easy striking distance of a lot of nice tops country. 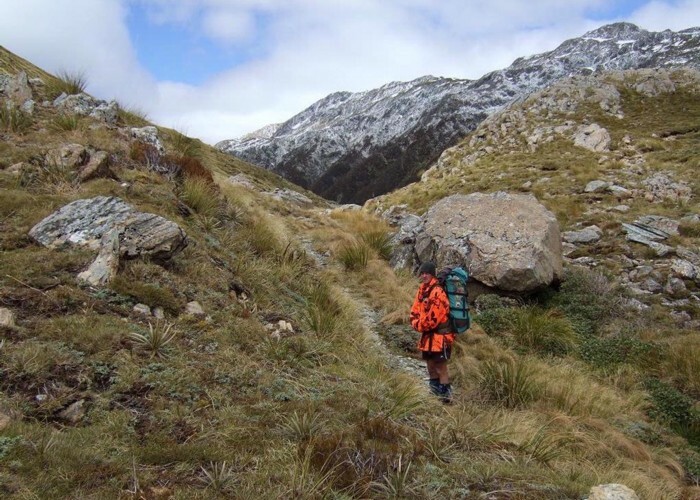 Best access is from the Haupiri River via Trent Saddle! Trent Saddle Nov 2010 • By glennj. Licence: C.
2/Up the Trent. 3 - 5 hrs from Mid Trent hut. Not to be attempted if river up! 8.5 - 11hrs from Waikite Downs Station sign. 3/There are various routes from the Taramakau River to Top Trent hut that involve unmarked tops travel. Added 9 November 2010 by glennjglennj. No revisions.